The first book in the instructional series by Freeman Patterson has just been revised. 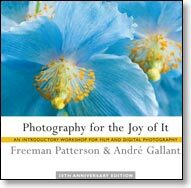 André Gallant joins Freeman and together they provide clear instructions for beginning photographers on shooting film and digital, choosing equipment, selecting correct exposure, using histograms, understanding depth of field and much more. Photographers learn how to make pictures with selective focus, showing motion, using flash, double or long exposures, and at night. The revised edition is accompanied by mostly all new images with informative captions. "This is one of the finest books we have been privileged to review in the field of photography." "A marvelously informative book by one of Canada's master photographers. Freeman Patterson breathes life, love and happiness into the art of making pictures."